Hi. The word ναὸν (naon) apears in matthew 26.61 but refers to the building. Matthew 27.5 and 27.40 too. So not sure if God’s temple of 2 thessalonians refers to ugly pope or even church. Catholic church is not the church of God BTW. Hi Nahuel 🙂 In Matthew 26:61 and 27:40 the Jewish leaders were repeating the exact words of Messiah. Messiah was not referring to the physical temple, but Himself. So when they repeated what He said, they used the same words as He did, naos, which does not point to the physical temple, but to Himself as he rose three days later. Matthew 27:5 is referring to the physical temple. We are the temple of Elohim. Messiah is the cornerstone, the Apostles are the foundation, and we are little stones that make up the walls. 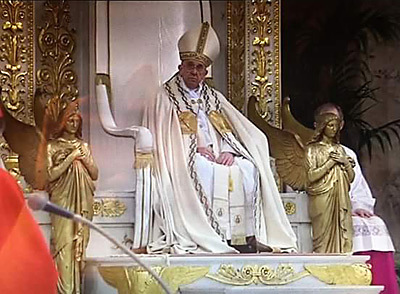 The Popes of Rome pretend to be a part of the temple, but they are delegated to the Court of the Gentiles, for they are a false religion. Sounds good to me. I like that your site is one of the few Christian sites that tell how the Zionist/Khazar ashkeNAZI jews are frauds. Still, you talked of the Roman Catholic Church being the antichrist. I don’t doubt it but I’ve read a LOT that tells how it’s the Zionists, themselves, who are the problem. Thank you for your comment Stevor 🙂 Sadly most Christian sites blindly support the Jews in Israel. In my research, all roads lead to Rome. The Jesuit Rothchild’s own and control the state of Israel. The Jesuits caused WW I and WW II, in part to push their agenda of creating the Zionist state of Israel. They did this to take control of Jerusalem for their end times deception, and to deceive Christians about Bible prophecy fulfillment. I believe that in WW III, Muslims countries will attack Israel, which will cause the world to cry out for an end to religious wars, which the Jesuits will gladly provide in their New World Order. The Jesuits use the Ashkenazi Jews as a front organization to steal the wealth of the world, to control the Middle East and attack other countries, etc., so that people will blame Jews/Israel for these things, not the Jesuits. You wrote ‘They did this to take control of Jerusalem for their end times deception, and to deceive Christians about Bible prophecy fulfillment’. Can you please explain this part further? I believe its to hide the fact that the Anti-Christ is already here, correct? But how does creating the Zionist state of Israel allow them to take control of Jerusalem? Or do they already control Israel and are just waiting for WW3 to then be given authority to operate their NWO from there? Thank you for your comment Alex 🙂 Yes, the Jesuits already control Israel through the Rothchild family. They manipulated the world wars to cause Britain to agree to give them the land, which is know as the Balfour Agreement. In 1921, General Allenby made good on that promise, by causing the Ottoman Empire to abandon Palestine. They filled the land with Zionist Ashkenazi Jews and caused Jews to be persecuted in Germany to help justify the creation of the state of Israel. Zionist Jews that are loyal to the Jesuits control the state of Israel. The Jesuits want to reign in the same place as Messiah died, as the ultimate mockery of Him. I’ve been trying to study & find validation of my thoughts that Scripture *isn’t* pointing to a 3rd, physical, Jewish temple & you’ve articulated my thoughts on these passages very well.